Shirtwaist factory workers like those pictured here in 1910 often worked long hours for low wages. Poor working conditions and bosses’ disregard for workers’ needs were particularly prevalent in the garment industry. Many workers who labored to make the popular shirtwaist blouses were women, and in Philadelphia many of those women were of Russian and Jewish descent. The workers pictured here likely worked in a shop at Ninth and Arch Streets, though their specific employer is unknown. 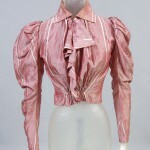 The shirtwaist blouse, seen here in a dark rose color, was a symbol for the modern, working young woman of the early twentieth century. The easy-to-wear garment takes its design from menswear and can be worn in a multitude of ways, with or without a jacket. 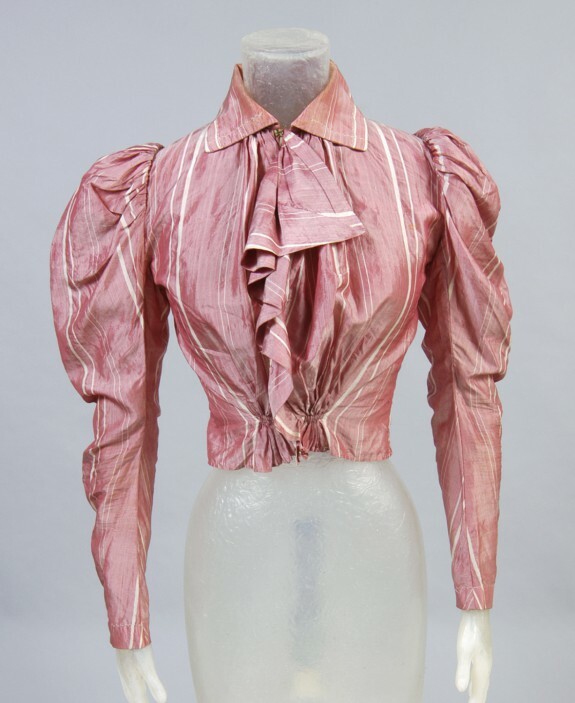 The basic shirtwaist design was easy to embellish, and designers added a variety of frills, ruffles, bows, and beading to make the shirts personalized and feminine. 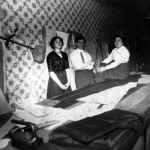 The majority of shirtwaist blouses were made in Philadelphia and New York, and many of the women who worked in the shirtwaist factories were the same young women who embraced the garment’s comfortable versatility. 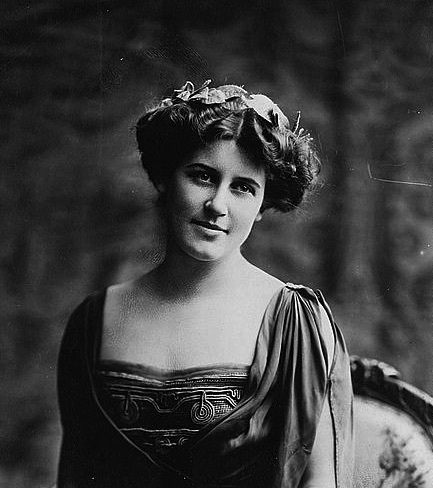 Inez Milholland (1886-1916), pictured here in 1910, was a feminist reformer arrested in Philadelphia while picketing in sympathy with the shirtwaist strikers. After being rejected from Yale, Harvard, and Cambridge Universities because of her gender, Milholland went on to receive her law degree from New York University in 1912. 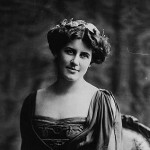 However, before Milholland completed her legal studies she was involved in a number of Progressive Era organizations, primarily those that addressed the fair treatment of women and children. In 1910 she also was arrested along with other picketers during a shirtwaist strike in New York City. As a young lawyer she became a face of activism for women and the antiwar campaign until her untimely death in 1916. On December 20, 1909, more than 7,000 of Philadelphia’s 12,000 shirtwaist workers walked out on their jobs, one month after the “uprising of 20,000” commenced in New York City’s shirtwaist industry. The strike lasted until February 6, 1910, when manufacturers agreed to comply with workers’ demands (though ultimately refused union recognition). Occurring in an era of increased unemployment, labor market instability, and worker militancy, the shirtwaist strike revealed tensions between Philadelphia’s Republican machine government and organized labor, as well as among elite members of the Jewish community, club women, and the young shirtwaist workers. 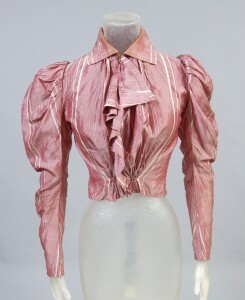 The shirtwaist blouse was a type of blouse common in the late nineteenth and early twentieth centuries, modeled after a man’s shirt, that was the model blouse for the independent, working woman. It was fashionable, had a collar, and could be of simple or embellished design, making it versatile. Approximately 85 percent of the shirtwaist strikers were Jewish women and girls from Russia, demonstrating the ethnic and gender segregation of Philadelphia’s labor market. Overall, 40 percent of workers in Philadelphia’s garment trades were Jewish, and young women and girls from Russia had high rates of employment. Most Jewish workers worked for Jewish employers, who often paid low wages and were generally first- or second-generation Jewish elites from Western Europe, who had settled in Philadelphia decades earlier. Members of this elite welcomed new immigrants hesitantly, devoting considerable resources to forge a pliant, assimilated working class. However, many newly arrived immigrant workers agitated for better working conditions against the call for “unity and harmony” among the community’s intellectual and business leaders. The shirtwaist industry operated under a subcontracting system, wherein manufacturers distributed work to contractors who, in turn, hired operators to make the garments. The manufacturers were not liable for any injury or illness workers suffered on the job, and workers were often responsible for purchasing their own equipment and supplies. To alleviate these conditions, strikers demanded a ten percent increase in wages on all piece and contract work, regular and consistent payment, an end to punitive firings, a cap of fifty hours work per week, sanitary working conditions, union recognition, and a free supply of work materials (thread, for example). In response to the strike, the city government pledged “sufficient protection” for shirtwaist manufacturers and began rounding up hundreds of picketing strikers per day. Workers and their allies were arrested for allegedly committing crimes that included intimidating, insulting, or “annoying” workers who were not on strike, assault and battery of police officers and strikebreakers, inciting to riot, disorderly conduct, and conspiracy. To maintain the strike, leadership from the International Ladies Garment Workers Union (ILGWU) and the Women’s Trade Union League (WTUL) solicited the aid of society women, who supplied the material support necessary for the workers to hold out. More than one hundred local unions also pledged solidarity, linking the strike to broader organizing efforts in the city, as well as to concurrent shirtwaist strikes in other United States and Canadian cities. The strikers faced tremendous opposition from the city’s business community, the Republican administration of Mayor John E. Reyburn (1845-1914), the police department, mainstream press, and Jewish elites. However, with the support of clubwomen (including Helen Taft (1891-1987), the daughter of President William Howard Taft (1857-1930), labor organizations, and rank-and-file workers, the shirtwaist strikers were able to stay on the picket lines long enough to secure substantive gains—including a system for negotiating piece-work prices, reduced work hours, and the elimination of charges for materials. More broadly, the political corruption of the Reyburn administration had alienated both reform groups and members of Republican Party. At a moment when growing numbers of elite women were organizing for universal suffrage, enough saw the plight of shirtwaist workers as a symbol of political oppression against women more broadly. While club women were most comfortable participating from a distance and on their own terms, their arrests from the picket lines populated front-page headlines. Overall, the strike revealed tensions that had already existed in Philadelphia, as well as the growing political involvement of elite women and the entrenchment of the city’s police force. Further, the strike showcased the power of organized labor, which would be witnessed in full force during the 1910 General Strike, which involved between 60,000 and 70,000 Philadelphians striking in solidarity with streetcar workers. Julianne Kornacki is a doctoral student in political science with an interest in the history of municipal and neighborhood politics in Philadelphia. Foner, Philip S. Women and the American Labor Movement: From Colonial Times to the Eve of World War I. New York: The Free Press, 1979. Klaczynska, Barbara. “Working Women in Philadelphia, 1900–1930.” Ph.D. diss., Temple University, 1975. Kornacki, Julianne. “Revealing Division: The Philadelphia Shirtwaist Strike, the Jewish Community, and Republican Machine Politics, 1909-1910.” Pennsylvania History, Vol. 80, No. 3 (Summer 2013): 364-400. Licht, Walter. Getting Work: Philadelphia, 1840–1950. Cambridge, Mass. : Harvard University Press, 1992. Sidorick, Daniel. “The ‘Girl Army’: The Philadelphia Shirtwaist Strike of 1909–1910.” Pennsylvania History 71, no. 3 (Summer 2004): 323-69. Whiteman, Maxwell. “Out of the Sweatshop.” In Jewish Life in Philadelphia: 1830–1940. Philadelphia: Ishi Publications, 1983. Seventh and Morris Streets, former location of New Royal Hall, where gatherings were held. 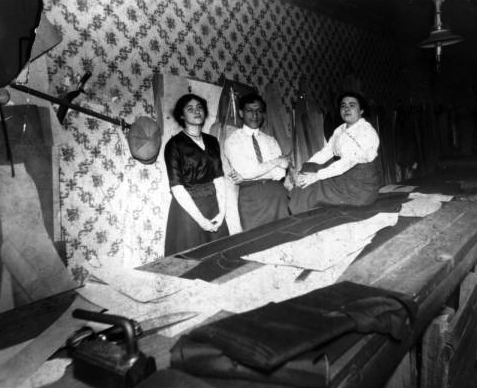 The shirtwaist makers lived and worked primarily in the Jewish communities located between Second and Eighth streets from Spruce to Mifflin streets, and in Northern Liberties at Fourth and Fairmount streets.